"Nothing really happens, but in a really good way." That's not my judgement. That's Sayaka Ohara, one of the show's voice actresses. There's quite a lot of Aria and I'm coming in blind at the end of it. There are 14 manga volumes (2001-2008), 54 anime episodes across three seasons (2005-2008) and now this tenth anniversary OVA series. What's more, it has fans who really, really love it. Starting with these OVAs is clearly doing it all wrong. I don't know the characters. I don't know the plot... no, hang on, the show has no plot. I'm fine there. It's the early 24th century and our heroines are gondoliers in Neo-Venizia, a city that's basically Venice but on Mars. (It was terraformed about 150 years ago and it's now covered in oceans.) Being a gondolier looks an idyllic life, although you have to put up with unpredictable work hours. Customers might book a ride at any time, you can't refuse them and they keep you very busy. However you do get to wear lovely one-piece dresses and ride a gondolier all day, being beautiful and serene... so, you know, it's not all bad. I couldn't tell you who anyone is. They're all basically the same. Sweet, elegant, kind-hearted people. However I did work out that some of them are newbies and/or trainees, while others have been doing it for a while and are presumably the main characters of the 2005-2008 shows. Those are just the humans, though. There are also cats. There's a goofy cat-thing who apparently runs the gondola company (despite never doing anything you wouldn't see from a domestic cat) and is a bit of a mood-shatterer. I could have lived without him. There's also a supernatural cat king called Cait Sith, who apparently can only be seen by children or something like that. He's basically Ghibli's Totoro. That was interesting. This show might be SF, but it's also a bit mystical. The most important character, though, is arguably the scenery. Neo-Venizia is to die for. Apparently the Japanese animators actually visited Venice to study the architecture and how to draw a gondola moving through the water. That's generalised stuff about the show as a whole, though. More specifically, what's interesting about these three episodes is how much melancholy they contain, but in a paradoxically happy way. They're saying goodbye. Ep.1 is about three old friends whose lives have moved and they're normally too busy to meet up any more, but just for today one of them's going to give another a faux-birthday present. Ep.2 is about a girl saying goodbye to Cait Sith, because she's growing up and she'll never see him again. Ep.3 is about someone accepting an offer to do... something. We never learn what. It doesn't really matter. These things happen; life moves forward and you can't jam your feet into the ground and just cling on to the old things. This lady is thus saying her last goodbyes to friends and looking for someone who can take over her gondola business. I wasn't blown away by ep.1. It would have meant more if I'd known the characters, though, while it's also the shortest and most lightweight of these episodes. Ep.2 seemed similarly pointless at first, looking like just another "cute girls do cute things" timewaster. However I got interested when we hit the Unfortunate Stone, which is childlike whimsy with our heroines being silly... and yet also somehow also more emotionally meaningful. The episode then gets magical. Cait Sith's goodbye is both sad and happy. It's sad because these two people (?) love each other and will never be able to see each other again. However that's the point. They understand it. They can accept what has to be accepted and can say goodbye with grace, love and affection. It's a beautiful scene, even though one of the characters is effectively a gigantic mute stuffed toy. After that, ep.3 is the most eloquent in terms of putting the theme into words. "The feelings of sadness and loneliness can also be the proof of happiness." "A seed of a wish unfulfilled keeps you moving forwards, giving you something to look forward to." "Towards the miraculous future." Written out baldly like that, you might think it sounds like a fortune cookie, but the episode sells it. It's sincere and wholehearted in how it expresses it. It's acknowledging that all things come to an end, but also celebrating the new things that we will build in their place. Twice in all this, once near the end of ep.1 and then again near the end of ep.3, we hear singing by a pink-haired girl. Her name's Athena Glory and she's voiced by Tomoko Kawakami, who died in 2011. The production staff didn't recast the role. That's Kawakami's voice we're hearing there. Did these OVAs make me want to watch the 2005-2008 series? Um... maybe. I'm a bit ambivalent about iyashikei shows. They're empty by design. They're not trying to tell a story, but merely to be sweet and heartwarming. 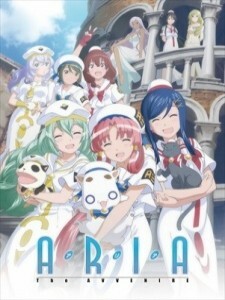 However I don't know how closely Aria adheres to the Empty Pointless And Cute model of iyashikei, since these three episodes aren't nearly as empty as I'd assumed at first. They're quite powerful thematically, while their emotional complexity and optimistic embracing of melancholy would probably stand up well to rewatching. Besides, no show that inspires as much love from its fans as this does can be all bad.